OKC.NET | ¡Naylamp Restaurante Peruviano – Comida Asombroso! ¡Naylamp Restaurante Peruviano – Comida Asombroso! There are over 3,000 varieties of potato in Peru. As an American of Irish descent, I have a genetic predisposition to potato addiction. So naturally, Naylamp Peruvian Restaurant on SW 44th St. is my dealer of choice. Fried, stewed, or boiled potatoes of some sort comes with almost any dish. See exhibit A below. 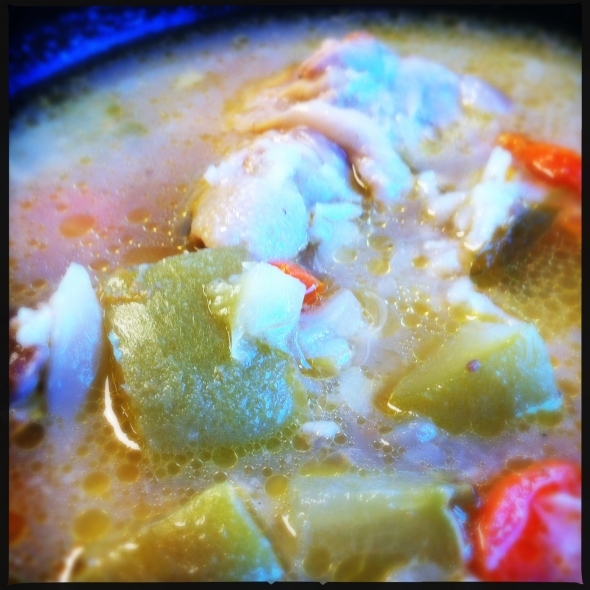 Exhibit A: witness the chunkiness of this delicious chicken and vegetable stew. Clearly this is not coming out of a can people. I started with a hearty chicken soup made, one assumes, from the previous night’s roasted chicken. The soup was just a classic soup done very well, complete with the customary carrots, celery, and potato. The roasted chicken, as ever, was delicious. The flavors were not overwhelming, it was a little sweet and savory. Other notes? The portion size is massive. This is not go to a small bistro and get a quaint little cup of soup. You see, if we’d been at a Vietnamese restaurant this bowl of chicken soup would have been comparable to a small bowl of Phở. And at $3.99 a bowl, this is a better deal when compared to most Phở places, which typically price their small bowls of soup, which if we’re going to be honest “small” really means “lumberjack” portion, at $5-6. So be forewarned, you may not have room for anything else should you order this at Naylamp, for an appetizer it is not. Exhibit B. Insert joke about “…taters precious.” Why? Um, because The Hobbit is coming out next month! For my actual entree, see exhibit B, I got the Chiccaron Puerco. 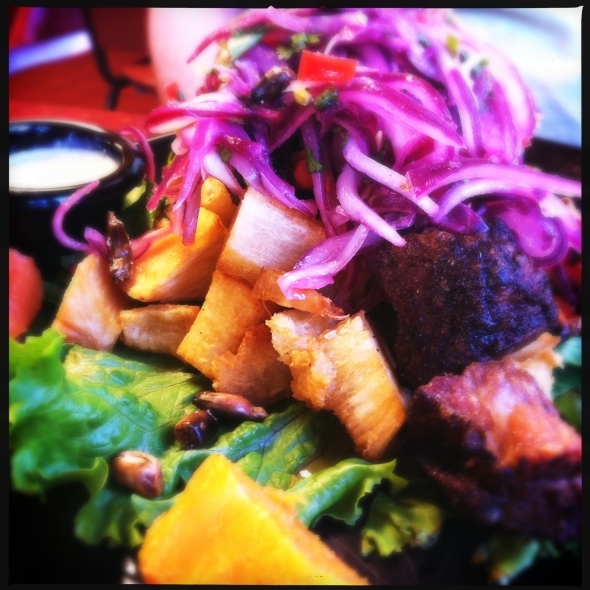 It is a salad of sorts with shredded cabbage, deep fried potatoes, fried pork, and sweet potatoes, served with a delicious cilantro cream sauce. The cool sweetness of the cabbage and sweet potato nicely offset the saltiness of the pork, which was crispy on the outside while remaining tender on the inside. Again, if you go to Naylamp, prepare to get a box; the portions are extremely generous. And that’s even without eating a huge bowl of soup first. 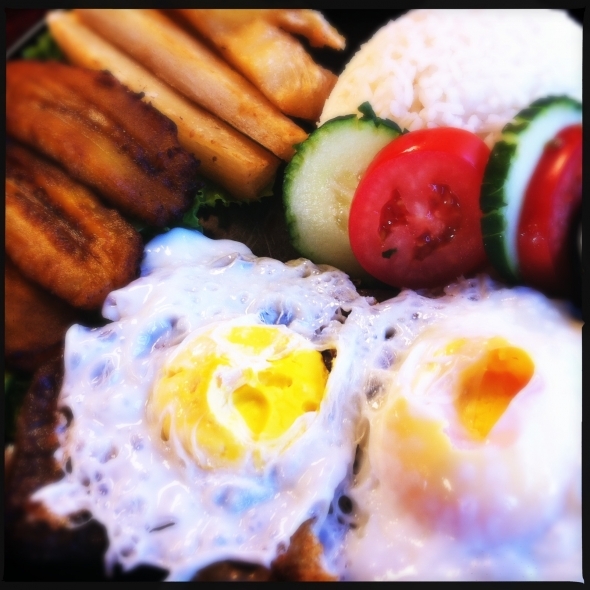 Exhibit C: Steak and eggs with plantains, potatoes, and rice. Helen reports that it was a nearly balanced but very tasty serving of protein and starch. Helen said that the steak in exhibit C had been marinated in a type of tangy marinade, and the eggs, while fried, were not greasy. She said the plantains were best eaten while still warm because when they cooled off their starchiness was more pronounced. The potatoes on the other hand were a gold variety that had a hint of sweetness to them. There were not mush as they were surprisingly very firm and dense. Helen also liked the cilantro cream sauce. She paired it with bites of cucumber, tomato, and steak. She reports that it also tasted great on the eggs and potatoes. Another thing about this Peruvian restaurant is their selection of beverages. See exhibit D. I got hooked on Inca Kola while living in Richmond, VA. And naturally because it was something new, Helen wanted to try their homemade Pineapple drink for the novelty of it. She said it was like drinking pineapple juice, but that there was definitely something else in it. Her guess was that it must have been a type of yellow corn. Another drink on the menu is Chicha Morada which is a pineapple and purple corn based drink. These homemade beverages of Peru cost $2.50, which also includes refills. 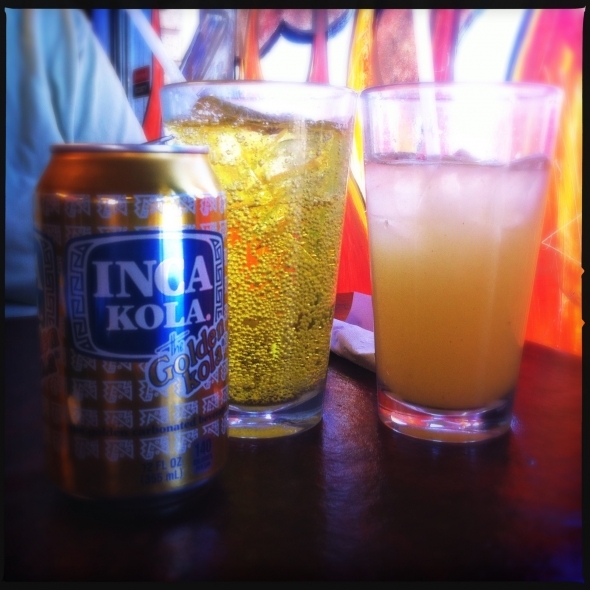 Exhibit D: Inca Kola on the left. Pineapple “drank” on the right. Naylamp delivers in several ways; overall value, originality, and range of options. We came at a slow point in the day, so our service wasn’t stunning, but I’ve been here during a normal lunch rush and they seemed to handle it pretty well. So if you’re sick of Tex Mex, Phở, BBQ, and want something hearty and filling, visit Naylamp. It is sure to be filling and flavorful if not very colorful too. Tagged BBQ, Chiccaron Puerco, Chicha Morada, cs, Inca Kola, Naylamp Peruvian Restaurant, oklahoma, Oklahoma City, options, Peru, SW, Tex Mex, VA. Bookmark the permalink.